Liberal Journalist Wonders why it’s “Collusion” for Trump… but Not for Hillary? Glenn Greenwald is one of my favorite liberal journalists, because he’s not a partisan hack. He calls out both sides of the aisle whenever they step out of his boundaries. This means that he is just as often found attacking Democrats as he is Republicans, and while I disagree with him about a lot of issues… I can appreciate that he is consistent. His consistency recently showed itself when he was appearing on the far-left Democracy Now! and he was willing to tell them some very hard things. Greenwald argues that the Donald Trump Jr. emails do NOT constitute a “smoking gun.” Then he followed that up with explaining that everything Donald Trump is being accused of doing, we know that Hillary Clinton’s campaign actually DID! Greenwald isn’t excusing either side’s behavior, but he is calling for both sides to be judged by the same standards. Glenn Greenwald: So here’s what I don’t understand about this. Certainly, it’s an interesting email. I’m glad that it surfaced. It does lend some credence to the possibility that the Trump administration colluded with the Russians criminally, meaning with their hacking of the DNC and Podesta emails, if in fact the Russians did that as the intelligence agencies claim, although they’ve produced no evidence for it. It is possible that the Trump administration or Trump officials colluded with the Russians to commit that crime. It’s possible they didn’t. We still haven’t seen any evidence that they have. Remember, this is not evidence suggesting that Trump officials actually colluded with the Russians to commit a crime—the hacking. Now, what the Democrats are saying is that the Trump administration and their defenders in the media at Fox News and the like are, quote-unquote, “moving the goalposts” by saying, “Well, this only shows that Trump Jr. was willing to get information from the Russian government about Clinton, but it doesn’t show there was actual criminal collusion.” To me, it seems as though the people who are moving the goalposts are the Democrats. The claim all along, the reason why there’s talk of impeachment, the reason why there is a special prosecutor, the reason why people want to see Trump and his associates criminally prosecuted, is because of the claim that they committed crimes by colluding with the Russians with regard to the hacking. That’s what Harry Reid has always said. That’s what John Podesta has always said. That has always been the Democratic claim. This newest evidence doesn’t in any way suggest that. What it suggests instead is that Donald Trump Jr. was told that the Russian government had incriminating evidence about Hillary Clinton and wanted to give it to him. And he said, “Well, I’d love to get it. I’d love to have it.” Now, I guess there’s some sense that it’s wrong for a political campaign to take dirt on your adversary from a foreign government. I don’t think it’s illegal at all to do that, but there’s a claim that it’s somehow sort of immoral. And here’s what I don’t understand. The Steele dossier that everybody got excited about, that claimed that the Russians had incriminating videos of Trump in a Moscow hotel and other dirt on Trump, that came from somebody who was getting first paid by Republicans and then by Democrats, going to Moscow and getting dirt about Donald Trump from Kremlin-affiliated agents in Moscow. In other words, he went to Russia, talked to people affiliated with the Russian government and said, “Give me dirt about Donald Trump,” and then, presumably, got it and put it in the memo. Similarly, there’s an amazing Politico article from January of this year that describes how allies of the Clinton campaign, including somebody being paid by the DNC, met with officials of the Ukrainian government, which was desperate to help Hillary Clinton win and Donald Trump lose, and get information incriminating about Trump from Ukrainian officials. In other words, Ukraine was meddling in our election by giving Democrats incriminating information about Trump. Now, I, personally, although it’s dirty, think all of these events are sort of the way politics works. Of course if you’re in an important campaign and someone offers you incriminating information about your opponent, you’re going to want it no matter where it comes from, whether it’s Ukrainian officials, whether it’s anti-Trump people in Moscow or whether it’s pro-Trump people in Moscow. So, I want to hear the standard that we’re supposed to use to assess Trump Jr.’s actions. Is it that it’s wrong in all cases to get incriminating information about your opponent from a foreign government? In which case, why is it OK for the Democrats to do it with Ukrainian officials or for their investigator to go to Moscow and get dirt on Trump? Or is it some other standard that distinguishes what Trump Jr. did in this case versus what Democrats did with the Steele dossier and with Ukraine? And I just don’t see this distinction. Amy Goodman: Some lawyers are saying it has to do with breaking campaign finance laws or campaign laws that have to do with getting something of value, not necessarily financial, from a foreign entity, a state or nonstate actor. Glenn Greenwald: Right. And there’s, I think, a lot more lawyers and a lot more campaign finance lawyers who have said that just getting information about a candidate would not constitute something of value. But let’s assume that that’s true. Let’s take that theory as though it’s true. Why doesn’t it also apply then to the person working for Democrats who went to Moscow and got something of value, namely information about Trump, from Kremlin-connected people in Moscow, or Democrats, including someone working for the DNC, who got something of value from Ukrainian officials? Why isn’t that the same thing? First of all, you know, yesterday, Democrats attacked Bernie Sanders, because Bernie Sanders, when asked about the Donald Trump Jr. email, came out and said, “There are obviously significant questions raised by this, but we shouldn’t rush to judgment. We should wait to see all the evidence.” And part of my discomfort with this whole thing all along—and as a lawyer, I know this really well—is that when you get bits and pieces of information leaked through the media without the full context of what’s taking place, it’s very difficult to assess what it actually is. There’s an independent prosecutor, Robert Mueller, who everyone regards as independent and trustworthy, who has subpoena power, who is investigating this. So, to me, what this email says is it’s from a British promoter who’s trying to lure Donald Trump Jr. into a meeting with someone who is his friend, saying, “The Russians want your father to win, and they’re willing to give you information to help.” I think it’s clear the Russian government wanted Donald Trump to win. I don’t think that’s particularly surprising. Nor do I find it surprising that Donald Trump Jr., when told that the Russian government wants to give him information that can help his father shed a bad light on Hillary Clinton, he was willing to do that. Why do we consider that surprising, let alone criminal? Again, I do think it bolsters the Democrats’ view that the Russians—the theory that Russians wanted Trump to win and that the Trump campaign was willing to take help from the Russians. But that’s still—there’s still a lot more steps that need to be completed before we get to any kind of evidence of an actual crime being committed. And that’s why I don’t think that this revelation, interesting though it may be, is as significant or a smoking gun when it comes to the impeachment or the prosecution case. Nermeen Shaikh: Well, Glenn, even though the Trump campaign has always denied collusion with the Russians in the 2016 presidential election, in his interview with Reuters yesterday, Trump suggested that there had been interference in last year’s election, saying, quote, “Something happened, and we have to find out what it is, because we can’t allow a thing like that to happen in our election process. So something happened, and we have to find out what it is.” So, could you respond to that, Glenn, and tell us what you think it is that he’s alluding to? 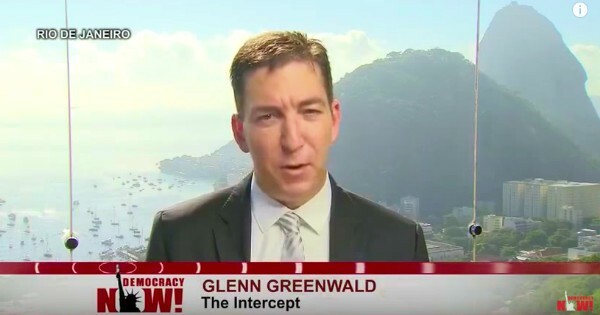 Glenn Greenwald: Well, I think there are two separate issues there that we shouldn’t conflate. One is the question of whether the Russians were behind the hacks. And when I say the Russians, I mean, was it just some group of Russians, Russian hackers or Russians acting in some rogue way, or was it actually—were they actually Kremlin officials ordered by Putin? We don’t know the answers to any of those questions, even though the intelligence agencies have said that it was Putin who ordered it. So that’s one question that I think, in that quote, Trump is talking about, which is, we have to get to the bottom of who actually hacked the DNC and John Podesta’s emails, and make the evidence public so that the public can see that these assertions that the intelligence community have been making actually have evidence behind them. Then there’s a second question, which is independent, which is: If it’s true that the Russian government hacked John Podesta and the DNC’s emails and distributed what they got to WikiLeaks, did the Trump campaign participate in that crime, either by working with the Russians before the hack or working with them after the hack on how to get the information distributed in a way that would most hurt the Democrats? That, to me, is the core question that has been at the center of this controversy from the beginning. And we still don’t have evidence that the Trump administration participated in that part of the crime. Hopefully, we will learn, one way or the other, in a sober, rational, comprehensive way, not through bits and pieces being leaked by agenda-driven anonymous sources, but by an investigation laying forth the case in a way that we can all see the evidence. Greenwald’s arguments here are BRILLIANT!